The Proton and Radiation Therapy Center of Chang Gung Memorial Hospital is the first proton center in Taiwan, and its establishment is a milestone in cancer treatment in Taiwan. Major team members of this center include radiation oncologists, radiation physicists, therapists, nurses, maintenance engineers and system operators, nutritionists, and social workers. This center provides the most advanced radiation therapy, humanistic medical environment, and comprehensive medical care to patients from Taiwan and all over the world. 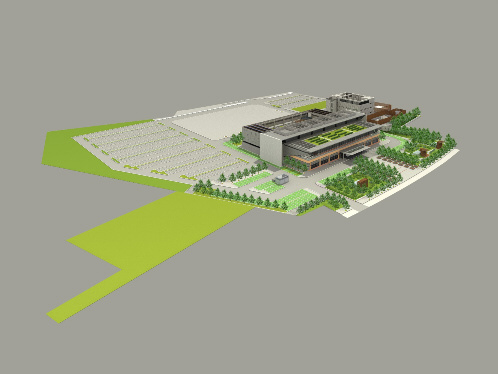 It contains four rooms with rotating gantry for proton therapy, and ten rooms for the new generation linear accelerator. Annually, it will treat around 3000 patients with linear accelerator treatment and 1500 patients through proton beam treatment. The proton therapy facility is one of the most advanced and expensive medical equipment in the world. At the end of 2012, there were thirty-six proton centers world-wide and over 90,000 patients had been treated by proton therapy. The number of facilities and patients treated is rapidly increasing. 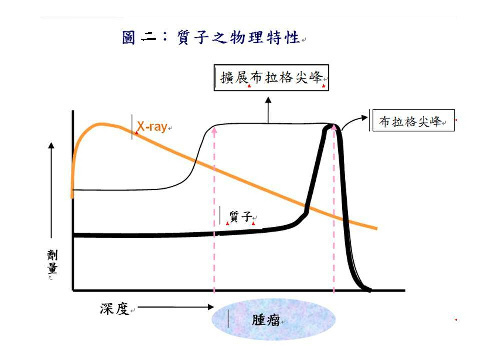 The most remarkable difference between proton and x-ray is that the proton beam releases massive energy at a desired depth decided by beam energy, but only a small amount of dosing is released along the length of the beam path, and there is no dose beyond the desired depth. These characteristics are well known as the “Bragg peak”. Through these characteristics, the proton beam not only precisely hits the tumor, but also minimizes the radiation dosing and side effects to normal tissues. Proton therapy is now becoming an effective and better method of radiation therapy for several types of tumors. Many clinical studies have shown that proton therapy improves local tumor control in patients with tumors at the base of the skull, liver cancer and early lung cancer, and decreases the side effects in pediatric cancer and patients with head and neck cancer. Decreases the risk of secondary malignancies induced by radiation. • Increases the direct radiation dose and probability of tumor control. Proton therapy is one type of radiation treatment and can’t replace chemotherapy, target therapy, or even most surgeries. It can be applied to tumors in different areas of the body, but the greatest benefit will be achieved for localized tumors on one side of the body. It is not indicated for patients who have disseminated tumors or multiple metastatic tumors.